Home politics Is Janasena ready to mingle with TDP again? 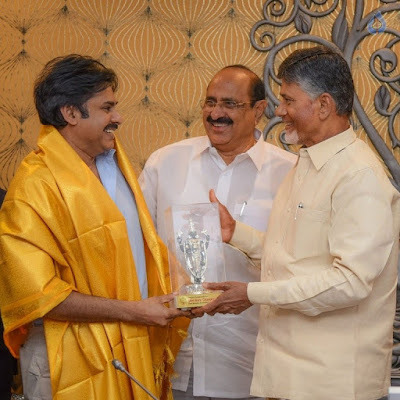 Is Janasena ready to mingle with TDP again? AP people are well aware of the fact that Pawan’s Janasena went hand-in-hand during 2014 elections and continued their friendship for 4years. However, Pawan Kalyan moved away from TDP and started questioning against TDP govt. But, recent moves from TDP head and AP CM Chandra Babu Naidu raises doubts over their differences. Many political still claim that Janasena and TDP are playing dramas. Recently, Chadrababu questioned YS Jagan asking what’s wrong if they mingle with Janasena and contest in coming elections. And in another instance, the CM has directly invited Pawan Kalyan to move with TDP and fight against the Center. Adding fuel to such moves, Pawan has kept silent and he majorly questioned opposition leader YS Jagan rather than blasting his old friend CBN and his government. These signs raised many questions about TDP-Janasena alliance. However, later Janasena tweeted that they are going to contest in the elections only with communist parties. But still political analysts have their own doubts. And, some claim it as CBN’s mind game to weaken Janasena.